Providing critical fire behavior information for initial attack decision making. For wildfire suppression and response, time is of the essence. Knowing where a fire is going, and when it’s likely to get there, is critical information. 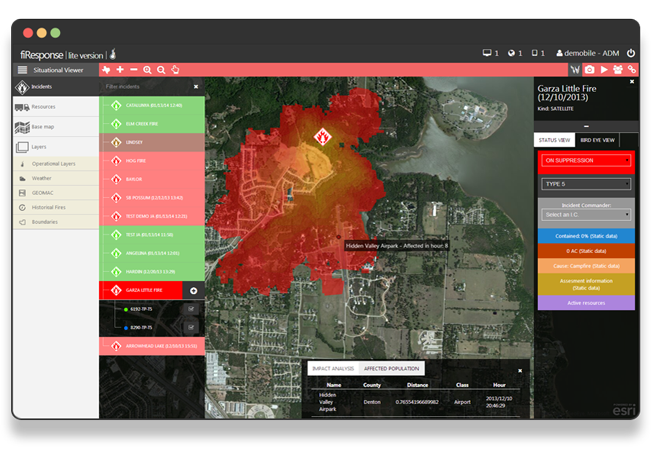 Wildfire Analyst was specifically designed to support initial attack situations, providing the Fire Chief and/or Incident Commander the intelligence needed to support timely decision making. Whether at the federal, state or local agency level, Wildfire Analyst provides robust and time-sensitive outputs for command staff to determine who, what, and where is necessary for an effective response. When coupled with our fiResponse software, wildfire management agencies are finally able manage incidents, potential impacts, and resources within a single operating platform. 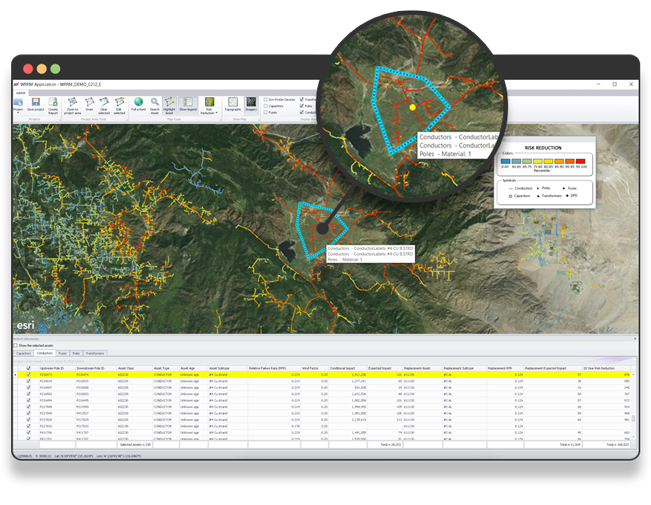 fiResponse™ utilizing Wildfire Analyst’s simulation capabilities in real-time. Wildfire Analyst also can be used to support risk analysis and land management planning for small and large landscapes. For example, the US Forest Service AMSET group actively employs Wildfire Analyst to conduct risk analysis for National Forests that incorporates ignition potential, fire growth simulation, values-at-risk, and response times. The different simulation modes available within Wildfire Analyst provide resource and land managers the ability to consider evacuation times, safety areas, exposure for critical resource and assets, and other conventional fire behavior outputs in determining treatment and management plans. The electric utility industry is impacted by wildfire as both a liability and a potential source of damage to critical assets. Energy companies are challenged with reducing wildfire risk and increasing reliability as part of their on-going rebuilding, hardening and maintenance activities. By maximizing risk reduction, companies inherently reduce their liability as a source of ignition, and also reduce the potential of damage to assets, lowering costs, potential outages and impacts to consumers and the public. Quantifying risk reduction requires robust and powerful fire behavior modeling combined with known characteristics and conditions of infrastructures assets. Combined with weather forecasts, the Wildfire Analyst API has been used to develop custom applications that integrate fire behavior modeling, with asset equipment failure rates and proprietary data, to determine which hardening projects will provide the greatest risk reduction. This allows companies to evaluate, rank, and prioritize proposed hardening projects to obtain the best return on investment, and quantify risk reduction to best meet PUC regulatory requirements. Our recent collaboration with San Diego Gas & Electric demonstrates how Wildfire Analyst Enterprise can be combined with leading edge meteorology and utility engineering to best protect companies, consumers and the public from wildfire. Showcasing our Wildfire Analyst clients. The utility of Wildfire Analyst is best shown by the applications and achievements of our clients. When combined with well understood business objectives and priorities the software comes to life. Have a look at a few of our recent client success stories to get a taste of what Wildfire Analyst might be able to do for your organization.